In 2014, Ye Olde Steakhouse was recommended as one of the top "10 Classic Steakhouses to Visit Soon" on Yahoo! Travel. Yahoo Travel sought out America's famed institutions of dry aging and in-house butchering. As one of these famed steakhouses, Ye Olde Steakhouse serves cuts with appeal as only achieved by the open flame grill. The standout cut: The filet mignon. It’s your choice of 6 or 8 ounces. We insist on Iowa grain-fed beef sourced from a local purveyor for every cut. Man-v-Food & ESPN - Todd's "Taste of the Town"
Adam orders a 60-oz. steak on Man-v-Food TV segment on the Travel Channel. 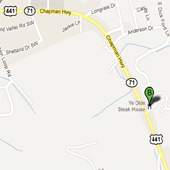 The NY Strip steak is grilled to perfection at the Ye Olde Steak House in Knoxville TN. Each week on "ESPN Saturday Primetime," analyst Todd Blackledge visits a local restaurant with his "Taste of the Town," a popular video segment that airs during ESPN College football broadcasts. Ye Olde Steak House was his place of choice where he enjoyed a 20 oz strip steak. When holidays, graduations, office parties, special events are on the calendar -- Ye Olde Steak House is the place to gather. Ye Olde Steak House racks up Best Steak House awards each year. On any given night there may be folks from 20 states.